I first heard the term ‘Joystick Coaching’ a few years back. What a wonderfully descriptive term. As with video games, joystick coaches want to dictate and control the movement of all players on the field. Hence the term ‘joystick’. However, there is very little joy to be had by players when they are coached in this manner. Joystick coaching has reaches epidemic proportions (and parents are just as guilty). Why is this happening? Look at other popular youth sports such as football, baseball, and basketball. Football and baseball coaches are joystick experts. Even in basketball where the game is more fluid (like soccer) and, therefore, more difficult to control and manipulate, coaches still try their best to dictate the action. Since many soccer coaches come from these backgrounds, it is only natural that joystick coaching carries over into soccer. We are a sports nation hung up on X’s and O’s. Joysticking is a natural by-product of this fascination. How many times do you see defenders standing in one spot because that is where the defenders were positioned on the dry-erase board? Soccer is not an easy sport to learn. No matter how many times coaches tell young players to spread out and not play bunch-ball, they still do. As such, coaches feel compelled to ‘help’ position and move their players about. Besides early player retirements, there are other consequences of this ‘helping’ behavior. In a sport that is very fluid where the action happens so quickly, players must be able to think on their feet and solve or address problems immediately. However, the more players are told what to do, the less they will be able to think for themselves. Players lose their sense of purpose. They are out there to play a game and try their best yet are constantly being told how to play. Once one adult starts maneuvering players on the field, other adults feel empowered to do the same. Soon, players are being told how to play and where to stand by coaches, parents, and complete strangers. And often, the three groups are giving three completely different instructions. What is a player to do? These are some simple tips that will help coaches curb the joystick epidemic and truly help players. Lead by example. Limited joystick coaching during games as much as possible. Set ground rules for your assistant coaches and parents. Explain the drawback of joystick coaching and having multiple adults ‘help’ players with conflicting instructions. Rather than telling players what to do and where to play, ask them how and where they should be playing. Let them think of the answer and assist only if they don’t know the answer. Coaches (and parents), leave your joysticks hooked up to your game consoles at home for use with FIFA ’10. If you don’t, you’ll be using the actual joystick much more since Saturday mornings will soon be free. Author’s Note: This post is one in series of posts that breaks down the 2010 Soccer MVP Tournament competition. Be sure to look at the final results to review how ‘Inside’ was crowned champion. I believe that receiving, or controlling the ball, is the most important skill in soccer, bar none. Every player possession starts with a ball either thrown or kicked to a player who then needs to control it in some fashion. 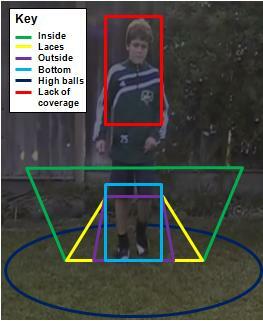 Of the four feet surfaces that made the final round of this competition–inside, top (laces), outside, and bottom–‘Inside’ not only won the receiving discipline but it was capable of controlling 90% of all balls passed to a player. In baseball, the goal is to catch the baseball in the mitt. In football, the goal is to catch the football with the hands. Once these catches are completed, the player will either throw to first base or turn and run up field, respectively. In both cases, a successful catch does not really dictate a player’s next move. Soccer is different. In soccer, how the ball is received always dictates a player’s next move. Since soccer is such a fluid sport with players constantly moving, it is preferable for a ball not to be received and come to rest in the same spot. Rather, the ideal method is for the first-touch (the first touch a player makes on the ball) to push or direct the ball away from the player receiving the ball. Where the ball is pushed or directed and how far away from the player the ball rolls depends solely on the first-touch skill of that player. 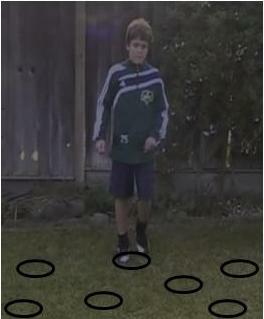 To test ‘Control’, various targets were placed in front of a player (black ovals in the image to the right). Then rolling passes were kicked at a player as well as to either side of a player at various speeds. The goal was to first-touch the passes as close to the intended targets as possible. Because of the structure of the inside-of-the-foot and the ability to cushion the passes, ‘Inside’ was the overwhelming winner. ‘Inside’ consistently settled the ball in each of the targets regardless of the speed of the pass or which foot received the ball. ‘Laces’ and ‘Bottom’ fared well when the target was under the feet but did poorly with the outer fringe targets. ‘Outside’ had better luck with the outer targets but was only able to push the ball in one direction. The ability for ‘Inside’ to control 90% of all passes was not a typo. Refer to the image on the right to understand how I arrived at this percentage. In the image, the four surfaces are represented by various colored lines: green (Inside), yellow (Laces), purple (Outside), and light blue (Bottom). The geometric shapes on the vertical plane represent the areas-of-coverage that each foot surface can comfortably control when a rolling or bouncing ball was passed to a player. ‘Inside’ was clearly able to control more passes, especially passes that were thigh-high and away from the player. The other surfaces did OK when the ball was passed directly to a player. The dark blue oval on the horizontal plane represents the area on the ground that was controlled by a player when the ball was passed high in the air. Remarkably, ‘Inside’ was able to control all of these high balls, even ones that were passes over a player’s head. ‘Inside’ achieved this control by applying a trapping technique whereby a player let the ball first hit the ground and then immediately covered (or trapped) it with the inside-of-the-foot. ‘Laces’ and ‘Outside’ were able to control the same high-ball passes as ‘Inside’. Both ‘Inside’ and ‘Outside’ were able to push the trapped ball away from where the ball landed. ‘Laces’ could only settle the ball in the same location that the ball was first controlled. ‘Bottom’ had a difficult time controlling these passes with any degree of success. The red rectangle on the vertical plane represents the area that could not be controlled with the feet. These passes could only be received with the chest or head. As you can see, ‘Inside’ is quite accomplished when it comes to receiving the soccer ball and easily won this discipline. Given the level of proficiency and the importance of receiving the ball under control, players and coaches should continuously work on and develop a strong ‘Inside’. The other disciplines evaluated in this competition were: structure, dribbling, passing, shooting, popularity among professionals, and ease of learning. As a referee, I have had the opportunity to see many age groups and different calibers of players. I am always surprised at the number of players, even high school players, who don’t have the ability or the confidence to control the ball out of the air. This is most evident when a goalie punts the ball but it happens on corners, free kicks, goal kicks, or anytime the ball is kicked high in the air. I equate being able to control a soccer ball out of the air to catching a pop-up in baseball. At first, catching a baseball is very intimidating. The ball is hard, the ball is hit high, and if a player miscalculates a catch, it could cause a serious injury. I know I was scared to death when I was first asked to catch a pop-up. But at least in baseball, there is a glove you can use. In soccer, there is no glove. The problem with letting the ball hit the ground in soccer is that at that point, it is anyone’s ball. Usually it will be the faster, more aggressive player who gets to it first. If that is your player, great. If not, you will find yourself in a heap of trouble more than you would like. Also when the ball is punted by the opposing goalie, the ball is heading toward your goal. If the ball bounces several times before it is controlled, it will be dangerously close to your goal. As a youngster, I made my living knowing that most defenders would not be able to control the high kicks. Therefore, once a ball was punted or kicked by a teammate and I knew I was not going to be able to control it, I would simply anticipate the defenders missing the ball. When they did, I would be well on my way toward the opponent’s goal. Even after college, this strategy worked very well, although the defenders would miss these balls much lest frequently. It is worth mentioning about headers. I’m not a big fan of headers, especially with young players. First of all, the spot on the head that should be making contact with the ball is actually the forehead. Now imagine the thoughts that must be going through a young player’s head when the coach tells him what part of the head should be used. “But coach, the ball is going to hit me in my nose!” is a common response (and often it does). I would be scared too. So for a long time, young players will hit the ball with the top of the head which is not the part of the head they should be using. As coaches, I would make sure to teach your players the proper heading mechanics but greatly discourage them from using their heads, especially on high punts or kicks. Tell them to use their ‘gloves’ instead. Soccer balls may not be properly inflated. Over-inflated and under-inflated balls can really hurt when they are not headed properly. Over time, who knows what long-term damage could result. While coaches probably teach their players the correct way to head a ball–always using the forehead and not the top of the head–rarely do players practice heading extremely high balls. Usually any game-simulated heading exercises come from corners or free kicks where the trajectory of the ball is not nearly as steep. Players rarely have any control of where the ball ends up after heading the ball. High balls are very difficult to judge. For an outfielder in baseball, it takes many years to learn the fundamentals of catching a routine pop-up. Same thing in soccer with high balls. Since many coaches don’t practice controlling high balls, the offensive team should take full advantage of this, especially when going with the wind. This is how to do it. Have your goalie punt the ball as high as possible straight down the middle of the field. The higher the kick, the more the wind will carry the ball. At least one forward should always assume that the defense is going to miss the ball. This happens more often than not in youth soccer. Playing the miss will result in many one-on-ones with the goalie. Consider putting in the goal the player who has the strongest leg but who may not necessarily be your best goalie especially when down a few goals and when going with the wind. With the wind to the goalie’s back, you will be able to take advantage of her long punts. After seeing that the long, high punts are a problem, have your last one or two defenders play further back than usual. It is always better if the first bounce is in front of the defender, not in back. By playing a defender back, it will be easier for her to run up on the ball, if necessary, to control it. Controlling these types of kicks should be done with the feet, not the head or even the chest. If properly taught, it is very easy to control the ball with the feet even from great heights. It is just a matter of practice.